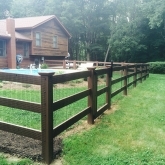 Have you been looking for a fencing service for your home or business in Stevenson, CT? Welcome to Roots Landscaping! 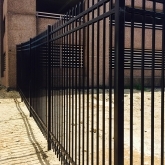 We have a professional team that is experienced in many types of fences, repairs, and installations. 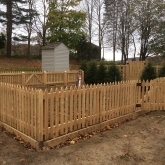 Roots Landscaping is the go-to fencing company for Stevenson, CT. It is likely you’ve seen some of our projects in your town. We are ready to help you with your fencing projects! We want to help find the perfect fence for you! Roots Landscaping is here to help you choose the fence that is just right for you. Roots Landscaping is a part of the American Fence Association. We pride ourself on top quality work. There are many different types of fences. So the first thing to do is figure out what type of fence you are looking for. Are you looking for more privacy? More security? Roots Landscaping is here to help figure out which fence best fits your needs. Our staff is prepared to help Stevenson residents bring their fence ideas to life. If you want to learn more about our exceptional fencing products, visit here. There are many different types of fences. 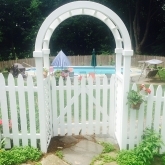 Roots Landscaping is here to properly install your fence in Stevenson, CT. Fence installation can be an arduous task. That’s why it’s important to have professional help. Once we figure out the best fence for you, we will analyze your property to ensure proper installation. Roots Landscaping takes land measurements, terrain assessments, and gets everything in order for installation. Price will depend on height, material, and length of fence. Stevenson residents can count on Roots Landscaping to take care of all fence repairs. We have an experienced staff that can help determine which repairs are needed and what steps need to be taken. Wood rot is a problem that we see a lot. This happens when fungi eat wood, which causes the fence to break down. If wood rot is caught in a timely matter there are repairs that can be done: chemical treatments, patching, repainting, staining. However, if wood rot is not caught in a timely manner the entire fence may need to be replaced. Roots Landscaping is Stevenson’s go to for repairing or replacing wood rot in your fence. Poles are an important part of your fence structure. If poles are damaged in any way it may cause structural problems for your fence. This can lead to your entire fence collapsing. Our team is here to replace or repair your fence poles, as well as keep your fence structurally intact. Repairing holes and cracks will vary depending on what type of fence you have: wood, vinyl, or chain. This will impact the types of repairs needed. It is important to fix all holes and cracks to keep your fence in good condition. Stevenson residents can rely on Roots Landscaping to repair any holes or cracks. Roots Landscaping can also help replace any missing boards in your fence. 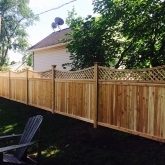 Not replacing missing boards can be detrimental to your entire fence. Therefore, it is important to replace them quickly. 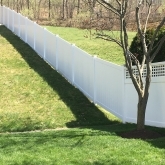 The replacement process is different for every type of fence. 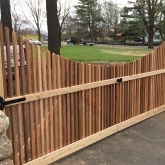 Contact us today if you live in Stevenson, CT, and need help repairing your fence! 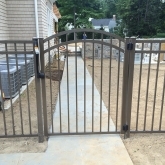 Roots Landscaping is here to provide Stevenson, CT, with any and all fence installations and repairs. Do not hesitate to reach out for more information on our company, services, and products. We also provide expert masonry and landscaping services. If you are interested in using our services, call us today at 203-702-4408. We are a highly rated company that is accredited by the BBB standards. For more information on how we can help you, contact Roots Landscaping today. You may also call us today at 203-702-4408.